Going off a very similar question, "piano notation implies that the upper clef is the part played by the right hand, while the lower clef is the part played by the left hand." Is there some technique that would be missed if one hand played d# and e over for the top and bottom of the grand staff? So now both lines of the staff are treble clef. The same two notes are played, but the piece makes it seem like both hands are suppose to switch off playing these same two notes: d# and e (upper treble), same d# and e (lower treble), repeat. I realize that most of the songs in this book are to learn certain music theory (rather than the piece alone), but do the Bastiens intend students to have both hands switch on and off? Or is Mr. Miyagi making waxing...tedious? The notation reflects the voicing (if you are having two staves anyway, why write the voicing in a single staff?). But actually executing the voicing with both hands is not the worst idea: it makes it easier to maintain consistent per-voice articulation, phrasing and volume. In this particular case, you'll likely have your hands playing staggered and the hand further out on the keys plays with slightly different mechanical resistance, too. A Bach keyboard fugues has four voices running through both hands, with frequent crossovers and two parts of the hands playing different voices. Using different phrasing and articulation on a voice rather than a hand is a very very advanced skill. 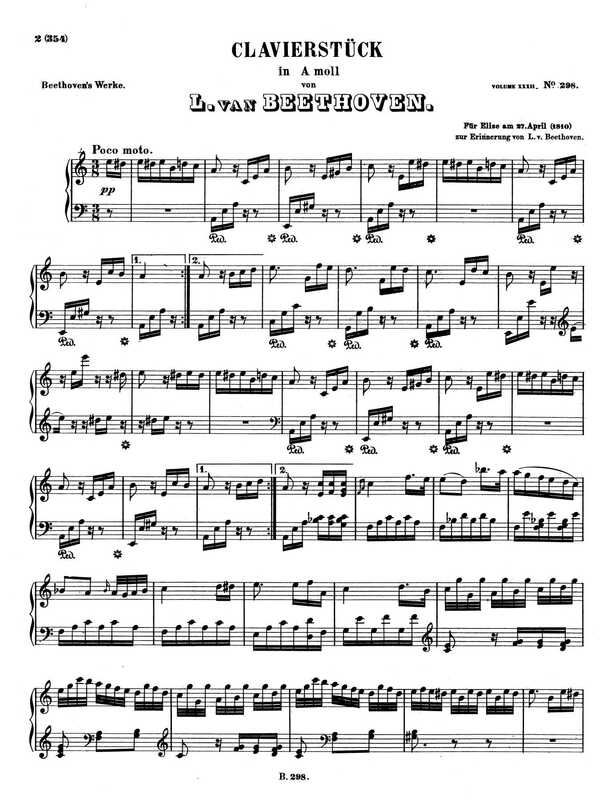 "Für Elise" is a piece intended for a beginner. Phrasing left and right hand subtly but recognizably differently is a good practice, and it's easier to pull off convincingly if you indeed keep the voices matched to the hands even in those situations of almost-overlap. Making the voice alteration a function of the handedness makes it easier for the player to appreciate it, and the player appreciating it is almost a necessary prerequisite for the listener appreciating it. So I'd really recommend not just treating this as a curiosity but actually trying to bring it across as a part of the piece's inner logic. Every edition I've seen has had this, so I assume Beethoven himself wrote it this way. Yes, the hands would switch off. Many people feel that repetitive motion should be avoided when possible, which is more commonly seen on repeated single notes: Many editors and teachers will suggest 3-2-1-3-2-1 etc. or something similar. As the player, you can choose to ignore this. I've never performed this piece, but I have played it for fun a few times, and I always just use my right hand exclusively. I also tend to play repeated single notes with one finger unless it's too fast. Avoiding repetitive movement can be important, but I think the reason here is musical more than technical. I've always assumed Beethoven specifically wants two voices here. He's already muddying the waters between anacrusis and phrase, and introducing the second voice takes that idea further. It makes me think of two British people trying to pass through a door at the same time ("After you...", "No, after you..." etc), and it implies a slight ritardando before the main melody resumes. It's a bit of flair, showmanship, or showing off! Of course it could all be done with one hand, and, eyes shut, the listener wouldn't tell. But it's a bit of fun. Done because it can be.Maybe there's a subtle difference in the sound, maybe it's one hand in a little conversation with the other, and it makes a change for the player, too. Not the answer you're looking for? Browse other questions tagged theory piano technique beginner or ask your own question. Why is the treble clef (in the lower staff) parenthesized? Which hands to use for Für Elise by Beethoven?